Everyone who has shared with Connecticut Cats Lost and Found their success stories after having found their missing kitties we are grateful and thankful . Although, the success stories we have posted are by folks that had posted their kitties on our website, we welcome anyone who has been successful in finding their kitty to post their story by sending us an e-mail to info@connecticutcatslostandfound.org For those whose hearts ache for their missing loved pet, this gives them encouragement and hope that they too will be able to find their kitty. A black and white Tuxedo kitty that went missing early in August of 2011 returns home after close to a month being gone. "We received the following email on August 25, 2011. "I'm pleased to report that Sachmo came back after 22 days! He got thint but good overall. We appreciate your website a lot and are so happy to have out cat back. Wendy"
We received notice that on August 10, 2011 a black and gray ,2 yr . old cat named "Kitty" was missing from Danbury, CT and published the ad. On August 12, 2011, we received the following good news message from Kitty's owner: We thankyou so much for your kind and helpful email! Kitty came home this morning! We searched all the surrounding neighborhoods, guess he was hiding out?At least I know your site...It is truly wonderful and reassuring to know when you are feeling so helpless..Sincerely Lori. Cat Sage went missing a couple of days ago from our Mystic home. She is very friendly and will come when called. ﻿This ad was posted on July 28, 2011. Three days later we received the following good news:" We found Sage!!!! After searching the neighborhood every day and calling every morning and night she just appeared in our driveway when I came home from work today! I really appreciated it! I will make sure to tell people about your organization﻿.Mehgan"
Indoor only,7 month kitten “Alice” missing from Davis Rd.,Oxford since June 7, 2011. On June 12th, we received this wonderful news from the kitten's owner: Thank you for posting missing Alice'. i I'm happy to report that she resurfaced. My son heard her meowing and found her under some brush near the house. She's tired, hungry, and her paws a bit torn up but I think she's okay. We're quite relieved that she's home safe and sound. Your advice is quite accurate - she stayed very close to home. We had been out several times a day with food - nighttime walks looking for her, etc. She was hiding in some brush 25 feet from the front door and I guess today she decided to come out. Thank you so much for the kind words and getting back to me, we have been looking day and night and finally last night we found our Junior and we just had finished putting out flyers all over our neighborhood and by 9pm he was crying on the opposite site of our backyard. We are so happy he is home sale. Thank you so much!!! This cat was reported as missing to connecticutcatslostanfound.org in april 2011. The following ad was placed on our Website : "Our 11 yr. old Cat "Clyde' is missing from Norwalk, CT since 4/28/2011. He's black with a little white. One eye is blue and the other one is green. If you have any information, please contact Jennifer." BUT a day later we received the following joyful email from Jennifer: "We are happy to say Clyde is back with us"
This cat named "Dalia" was reported missing from Hartford to us on March 12, 2011. A day later, we received the following email :I have great news - Delia came home late the next night! She is safe and healthy, and a total momma's girl since her scary adventure. Thanks again, Brynn. "Thank you so much for your help. Lady actually came home last night on her own after being missing for a week with an ice storm and far below freezing temps! Thank you again - what a wonderful service you have here and I will spread the word. This Persian kitty from Fairfield was reported to us as gone missing on Christmas. After we posted the ad for this lost kitty, we received a joyful email on Dec. 28, 2010,from the cat's owner. "Thanks much. Fortunately this morning he gave us a belated christmas miracle, surviving two nights and a blizzard, showing up on a neighbors porch. I appreciate the help, and if you can pull the posting that would be great. Your info below was also right on, he didn't stray far, although was pretty quiet through our searching, but was resourceful enough to survive! "We reunited the cat and its owner last night. Please take down the ad running on your site. Thank you so much. All ended well. 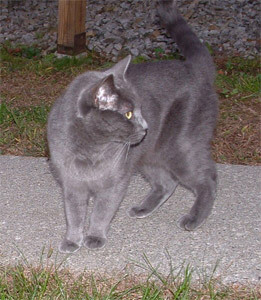 On October 2, 2010 we were notified that this cat went missing from Wilton. We had this ad"Lost. Small Black female with white chest and paws. About 7 years old. Has broken upper left canine tooth. Lost in the Weir Farm area of Wilton, CT. "THREE days later cat was found. We received the following email: " My cat came home. she seems like less of a baby, like she grew up. So good. Thanks for your help. -Jim"
"Happily, Jasmine has been found and is doing fine!! She was under the foundation of our house and was quite ready to end her adventure last night. I am very grateful to you for posting my notice on your website and for the wonderful service that you provide. "Thank you for the excellent advice. I talked to the neighbors at the bus stop this morning and I found the owner of the cat. She's an indoor cat that escaped. Thanks for your help. Val." "Thanks ! You’re exactly right. Sylvester was found last night uphill from me mooching off one of my neighbors who have a lovely, extensive garden. When I went on vacation, he did too apparently, and found himself the nicest garden he could find, then got those guys to feed him. He’s been hanging around up there since he went missing here. So, excellent powers of deduction on your part!" On August 22,2010, connecticutcatslostandfound.org receive the following e-mail that cat "JJ" from Colchester,CT who went missing on August 7,2010 came back home: "Good news JJ is home! I was calling for him day and night. We left food out and kept the garage slightly open. Than the other evening I opened the door to go out and in he came. Thank you for posting his picture and giving us hope. On August 9,2010, we received this e-mail: "I found a home for Gracie". This was a cat that somehow got stranded and lost and Priscilla found her. The following ad was posted on our website in attempt to find her owner: "Female white/orange tabby found in Meriden on May 18, 2010. Very loving and spayed. Vet has advised she's approx 2yrs old. Looking for her owner - or a new home. For more information: pfusco_5@yahoo.com"
We received the following joyful e-mail on July 26, 2010 about a cat named Poodle that went missing in Sharon, Connecticut. "You guys are amazing! And I'm happy to report that Poodle just showed up about a half an hour ago. We think that he was visiting another house and that he was fed there. He's going to be an indoor cat again and if we do let him out it will be on a harness and long lead. We live in a remote area and there are coyotes here. That was my biggest fear, of course. I'd like to make a donation to you guys... so please let me know how to go about it. You rock! I am a Christian and I had asked all my Christians friends to pray (over 30 people). Everyone was praying. Sarah is declawed front and back and is 13 years old and cannot defend herself. She was gone since Sunday May 2rd and then today May 4th I went outside to walk the dog and left the door open and when I came back inside she was on the table. Cat Julia from Kesington, CT was reported missing on March 20,2010 and we posted ad on behalf of her owners. A few days later, we received the following e-mail from her owner Craig. I'm happy and excited to report Julia is home! She was locked in a neighbor's garage a few doors down. "Great news! My cat Tony was found on Thursday and is back home! He seems healthy and is making the adjustment back to indoor llife after his adventure outside. I've attached a picture of him that was taken after he returned home. put a picture of Tony up on your site. food under my porch. I sprinkled some of his dirty litter in the area around the trap. He was caught in the trap sometime Thursday morning and I simnply brought him inside and let him out. looking for Tony as well.I have to tell you I was starting to get very pessimistic about finding Tony because it had been over a week. But, the message here is don't give up! 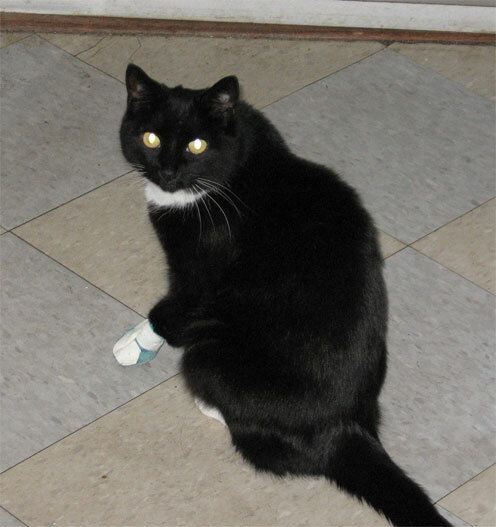 On March 6, 2010, cat named Spot from Old Wethersfield, CT went missing and his owner had placed on ad on our website. Only a week later on March 16, we received an e-mail from his owners with the wonderful news that he was found. Photo is just below with email from his owners Pete and Tina. "We found him! We are relieved and happy to have found our kitty, who is sleeping downstairs. He was brought to a local vet on Friday by a cat lover on the next street over! Spot was apparently in very bad shape, hiding under a bush in their yard, and we are lucky that he seemed to respond to an I-V drip. We had brought a poster to the vets in the area.... as suggested by your website. And it worked. We didn't get the poster to this vet until Saturday just after they closed, so although our cat was there at that time, they didn't make the connection until today. They called us tonight. So we are extremely thankful to all the people who gave us hope and help. We called the man who brought the cat in and have made a new friend. Thanks for your website--it was the easiest to use--I saw others afterwards as we were thinking of expanding our search, although didn't get to posting anywhere else,thank goodness. Tomorrow I have to try and cancel the lost cat ads I just placed today in the local newspapers--which I was touched to find out were free of charge. Now, poor Calico, Spot's sister, has to get used to not being an only cat.
" I just wanted to give you my great news – Scooter came home!!! We had left food out on the front porch (just in case) and yesterday morning I went outside & noticed the food was gone. I figured squirrels or skunks may have eaten it and didn’t give it another thought. A few minutes later, I heard Scooter meowing, I ran to the side of the porch & there he was staring up at me. I was in such shock I think I screamed!! He jumped up thru the bars onto the porch and I snatched him up, ran inside yelling and carrying on. He got lots of kisses and squeezes. I’ve attached a photo of him that I took this morning. He’s a bit thinner but seems to be OK but I plan to take him to the Vet just to make sure. I wish he could talk – I have so many questions!! I must say, he’s a lot more lovey dovey now (which works for meJ) and he follows us around all over the house, making sure everyone’s here. "Just a quick and very happy note to tell you that Reggie, the tuxedo cat lost in Vernon, found his way home with the assistance of one of my neighbors. Thank you very much for your assistance and good advice. "My cat Reggie was missing when I came home from work one evening, and I didn't know whether I'd missed him following me out the door in the morning, or whether he'd fallen off the balcony. I searched frantically, to no avail.The next day, when I'd calmed down enough to search more methodically, I saw the claw marks on the third floor balcony railing, as well as a big divot in the bush below my balcony. There were broken branches and tufts of black and white cat fur inside the bush. Fortunately, there was no blood, but unfortunately, Reggie was nowhere to be found. I postered, fliered, talked to neighbors, put ads online and in print, and contacted local vets and animal control. I searched and searched and searched, and still couldn't find him. After he'd been gone for five days, a ground-floor neighbor heard him meowing on her patio and let him in. He was hungry and covered in burrs, but otherwise fine and very happy to be back inside. Thanks for the great advice about how to conduct a search, and for providing a state-wide site for lost and found information -- I got a call from 30 miles away! And lesson learned: It doesn't matter if your cats have been using a balcony safely for years. It only takes one slip. Thought you would be interested to know that this kitty found his way home! The owner saw the sign I put on a pole and called. He had been missing since November! Just goes to show you! Never give up! Found in Bristol large fluffy black cat with four white paws, white belly, and a distinctive white dot on his nose has. He is very friendly. I think he is a neutered male because of his size and the fact that he doesn't seem aggressive or sprays. But it could be a female, too. I am sure he is not a feral stray as he REALLY wants to come in the house! I would like to find the rightful owner. Call 860-582-6358 or e-mail nonnymiss1219@snet.net to claim. Tuxedo kitty went missing on May 27, 2009 and was found by her owner almost a month later on June 22, 2009. Posting was on our website during the month of June. We received the following e-mail from her owner: Please remove the posting for my kitty which read""Female tuxedo cat about 12 years old missing since May 28,2009 from Bristol/Forestville area,bordering Plainville. If seen please send e-mail to tara.northover@dellmfg.com or call Cell: 860-614-1766. Thank You"
A neighbor about a mile away saw one of my postings and called me with a spotting of "Tash" behind her house. The poor girl had been living in the woods for some time, and had gotton quite skinny, but is otherwise healthy, and VERY happy to be safe at home again (she hasn't stopped purring!). I'm beyond happy to have my baby back. Thank you so, so much for your help. Please encourage others to post signs all over the neighborhood; I had 20, and it worked! People really do read them and care. Stanley was posted on our Website last week in September and found in October. The following is an e-mail we received from his owner. "Just a line to let you know we found our cat Stanley(gray and white) . After being missing for over two weeks he just wandered into our back yard. When he went missing we plastered the neighborhood telephone poles with his picture and our phone number. We did recieve about three calls with sightings up to a half mile away but never found him when we went to investigate. He is very thin and talks continuously since returning. He does seem healthy if not as clean as when he left.Thanks for your help and would you please remove our ad. Bill"
On Monday 12/15/08 I found (pulled out of traffic) an older, DLH tiger cat. He is an altered male with one eye, and is declawed. He was found on the Newington/West Hartford town line near Temple Sini. If this kitty belongs to you please call 666-9232." "I just wanted to let you know that the kitty and his owner were reunited last night. She called the Humane Society and they gave her my name and phone number (I had left on a message with them earlier in the day). She was frantic and so happy to have her kitty back. I'm so happy he made it home and we had a happy ending!!! Thanks for all your help!" If you have a success story, please send an e-mail to us and will surely post it.